I am in disbelief that Thanksgiving is just a week away. The weather in Wisconsin has been gorgeous all fall, which is nothing short of a miracle here. But the mild, warm, sunny days have made it a little challenging to even think about the upcoming holiday season. I’m sure participating in the One Room Challenge probably also had something to do with my overall lack of holiday mindset. But now that the Challenge is over, it’s time to turn the focus toward the massive to-do list that seems to grow every year around this time. This year I’m bound and determined to be on top of things. Which I may, or may not, say every year about this time but not exactly ever manage to do. This year is different though– I’m feeling on the ball now (maybe??). Either way, it will all eventually get done- just hoping to get it down without turning into a ball of stress and missing out of the joys of the seasons. So much planning goes into these holidays, and you blink and it’s over. I’m hoping to do a more enjoying this year and a bit less stressing. To help shift my mood toward the holiday season, I’ve whipped up a fruity, festive champagne spritzer that’s just the thing to ramp up the holiday spirit, and maybe knock down a bit of that stress too. This sweet bubbly cocktail is enough to make any holiday bright, and is just the right color to for the season too. It would work perfectly as a signature cocktail at a seasonal party or even just for a toast around the table with family. This spritzer has a few of my favorite things (sung to the tune of course) – champagne, elderflower liqueur, and pomegranate. Of course champagne is a staple of the holiday season, but not many people are aware of what elderflower liqueur is. I discovered St. Germain elderflower liqueur last summer and have been looking for it in cocktails on drink menus ever since. St. Germain is made from fresh, hand-picked elderflowers in France and is made using an artisan process. It comes in this super trendy art deco style bottle, so it’d make a great gift for the cocktail lover too (fyi, a mini bottle (200ml) like this cost around $18-$25). St. Germain is a sweet liqueur with soft floral notes that are flavorful, but not too overwhelming – which makes it balance really well with the dryness of champagne. Add in a little pomegranate juice, a few arils (the juicy seeds inside the pomegranate) and some club soda and you’ve got an easy holiday drink. And the bonus? Pomegranate juice and arils are healthy for you! Its anti-inflammatory properties can help combat all that holiday stress! And well, I suppose the alcohol might help with that too. 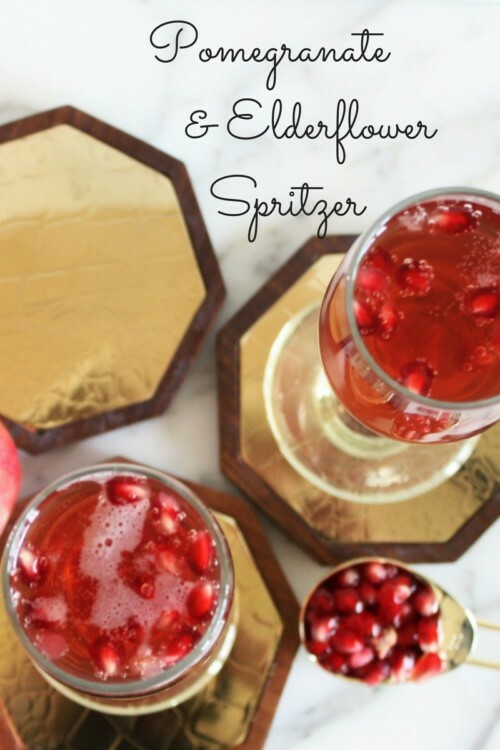 In one serving glass, add club soda, champagne, pomegranate juice, St. Germain and Pomegranate arils.